Damien Wright and Bonhula Yunupingu. Wunhakali (Other Side) (detail). 2016. Materials: Gadayka, Copper Wire, Epoxy Resin, Tung Oil Finish. Dimensions: variable. Photograph: Connor Tomas O’Brien. Exhibited at Castlemaine Art Museum’s 2017 exhibition, The Extractive Frontier: Mining For Art, co-curated by Beverley Knight and Clare Wright, Bala ga Lili (Two-ways Learning) (2016) is a cross-cultural collaboration between Melbourne furniture designer, Damien Wright and Yolngu man, Bonhula Yunupingu, who is a member of the Gumatj clan of Gunyangara in north east Arnhem Land. I spoke to both men about their work and soon learned that two-ways learning is the gift that keeps on giving and that this story has no full-stop. Before their story begins, I would like to acknowledge the Gadigal people of the Eora nation, whose traditional lands I live on and offer my respect to the Elders past and present. Damien and Bonhula met seven years ago when Damien was asked by Gumatj leader, Galarrwuy Yunupingu to help his clan with their furniture studio. 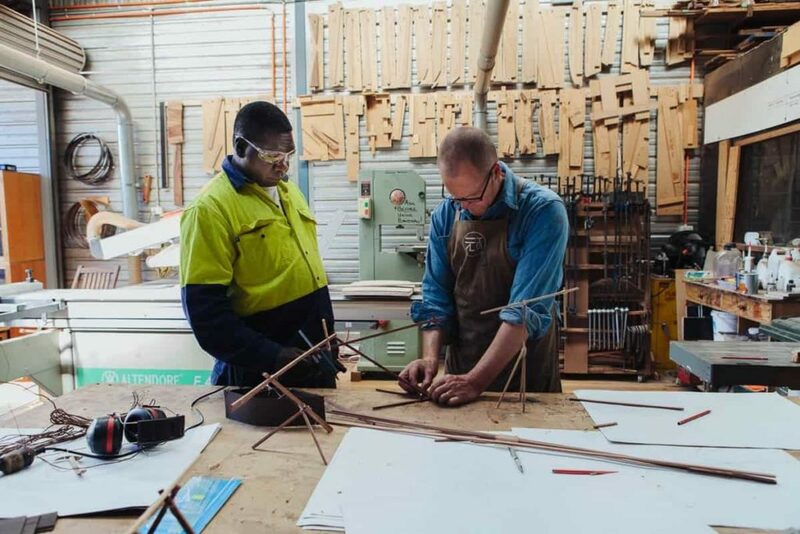 Galarrwuy had read an article about Damien’s dogged insistence that 10,000 year old Red Gum be used to construct a table he’d been commissioned to design for the County Koori Court in Victoria. 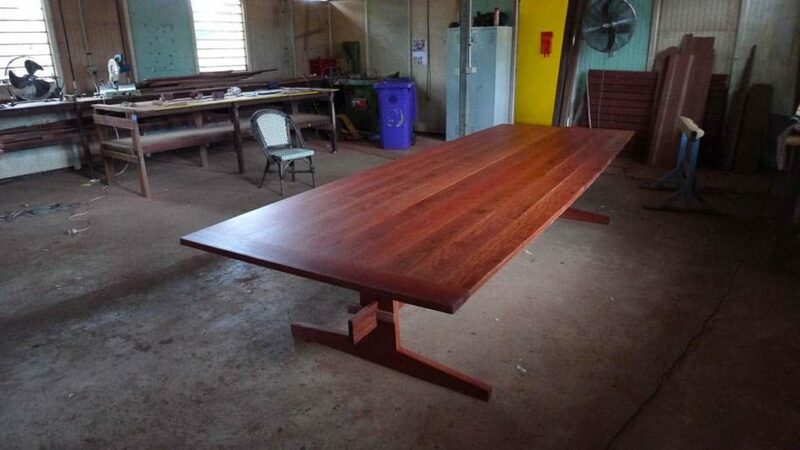 His intent with the use of the Red Gum was to acknowledge the presence of a history and culture pre-dating common law. The integration of this significator of the overlapping of place, time and culture in a table around which the judiciary, tribal elders, Indigenous offenders, their families and communities would gather for trials, convinced Galarrwuy that Damien might be the right man to help his people get their workshop up and running. Gunyangara is located near the mining town of Nhulunbuy on the Northern Territory’s Gove Peninsula. The land the mine now occupies was a place for huts built and used by the Yolngu people when they were gathering food on the coast. It was common ground where a gurrtha (fire) visible to passing fishermen meant that they would be welcomed if they found themselves in the unpredictable waters of the Arafura Sea after dark. It was also a stomping ground and place for Bungal—gatherings where the infinite simultaneity of past, present and future are celebrated and sustained via dance and song. The arrival of balanda mob (white people) saw billowing smokestacks cast their shadows across the land and the warm, guiding light of the gurrtha was eclipsed by 24-hour flood-lighting. The hunting ground once favoured by the Yolngu is also rich in bauxite, which has been mined and refined for export on the site since the mid-60s. Concerned that the gadayka (Darwin stringybark trees) were being uprooted and burnt as waste-products by the miners, Galarrwuy made the 5,000km journey to Melbourne to invite Damien to Nhulunbuy to make a table with the Gumatj men. Damien agreed and over two weeks of ceremonial smoke and song, Bonhula Yunupingu, Djalung Yunupingu, Brian Gurruwiwi, Tony Munungurr, Russell Gurruwiwi and he had made their table. Galarrwuy was happy with their work and asked him to come back to run the workshop. Damien accepted the offer and soon after, he and his family packed their bags and moved to Gunyangara. 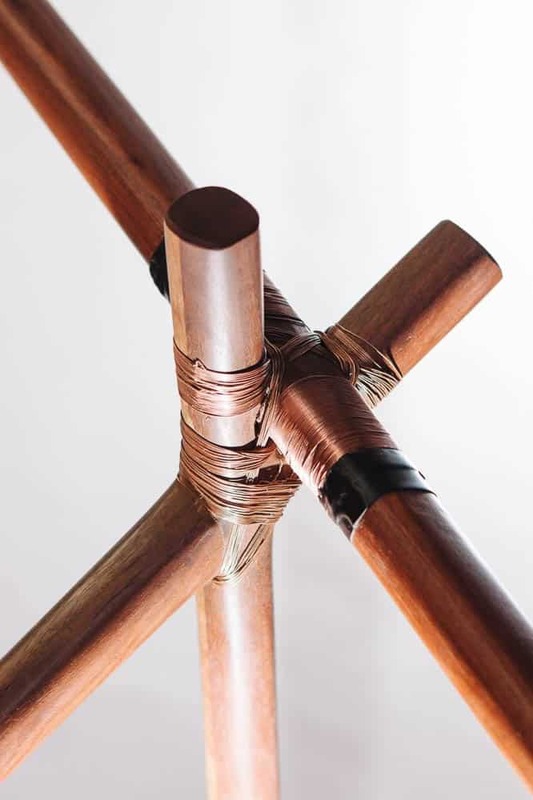 Although Damien acknowledges that there was some understandable scepticism about a Balanda “blow-in”, both men talk about how they hit it off while working side-by-side in the Dharpa Djama (woodworking) studio. Making and doing is integral to the Indigenous teaching model and with the simple act of rolling up their sleeves and getting on with it, the seed of their collaboration, Bala ga Lili (Two-ways Learning) (2016) was sown. Damien describes the light and intuitive touch required when blending studio methodologies with those of the community. “The nuances of their cultural and loyalty systems are unseen to us,” he says. While there were commonalities in the hierarchical nature of the workshop and those of the Gumatj community, the balanda approach to teaching was problematic. Bonhula and Galarrwuy called a meeting and suggested that Damien adopt the reciprocal learning method, Bala ga Lili. Bala ga Lili disrupts and levels the power relations intrinsic to the Western teacher-student model. “It’s better if we help each other… it makes the job easier,” says Bonhula. 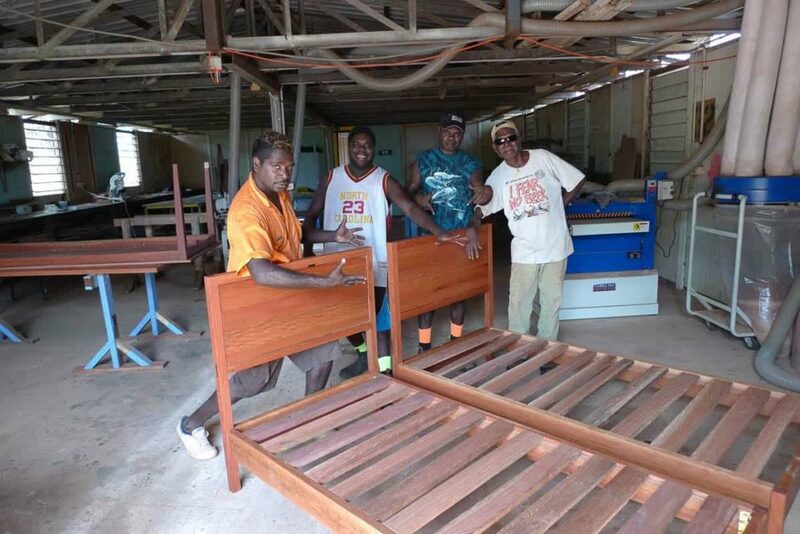 Bonhula Yunupingu, Tony Munungurr, Brian Gurruwiwi and Djalung Yunupingu with beds they designed and made the Dharpa Djama Studio. 2010. Photograph: Damien Wright. Damien observed that although the men were incredibly dexterous and had strong design principles, there was a gulf between the visual logic of the two cultures. 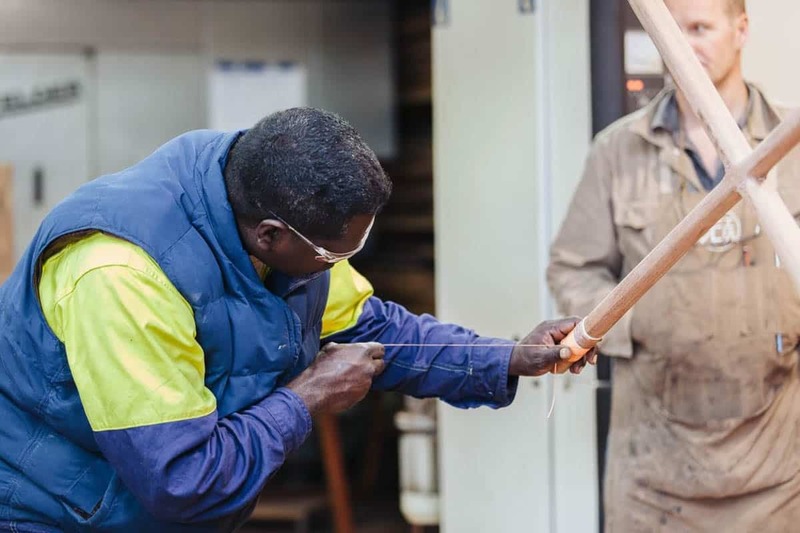 He realised that his challenge would be to integrate their woodwork techniques and aesthetic into furniture being designed and made for both Indigenous and non-Indigenous audiences. In addition to honing finishing skills, this involved sharing what the Western eye takes for granted, Vitruvius’ mathematical theory of proportions. Damien points out that what we know as symmetry is an aesthetic hegemony handed down to Western designers from the time of Caesar. “We inherited this visual logic, the Romans brought squares to the UK. Those guys (Yolngu) don’t have that.” Bonhula explains that “it’s all about balance,” which could also be said of Damien’s quest for mutually relatable systems. It’s a quest that led to his employment of the value canon to contextualise the furniture. Both use and hierarchical value had parallels in the community structure. Where the piece of furniture would go, its function and who would own it, were all transferable concepts. One of his lessons in kind was relinquishing the project management model, turning this methodology on its head and embracing Bala ga Lili. This facilitated a more collaborative, inclusive design and making process. Bonhula Yunupingu, Tony Munungurr, Brian Gurruwiwi, Djalung Yunupingu and Damien Wright. Dhimurru Board Table. 2010. Materials: Gadayka. Dimensions: 4200 x 1400 x 750mm. Photograph: Damien Wright. When Damien and his family returned to Melbourne, he and Bonhula kept in touch. “Mobile phones are a revolution for Indigenous and non-Indigenous relationships. 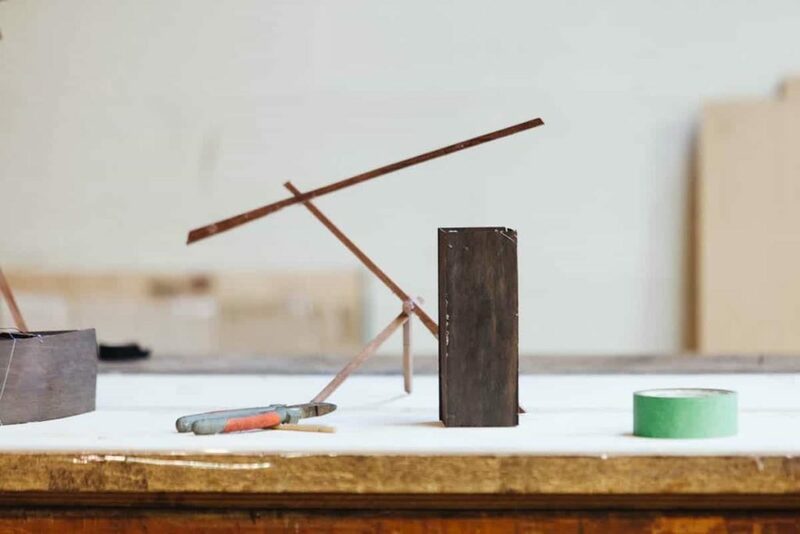 Not long ago, once we had left there would be no way I could maintain a relationship without regular visits, for better or worse, with phones the frontier is permeable.” Bonhula also visits Melbourne and works with Damien in his Northcote workshop. It’s immediately apparent that the friendship runs deep, Bonhula describes Damien as “a good fella to be around” and Damien says of Bonhula, “he’s a generous teacher and has a terrific sense of humour” There is a deep and abiding strength inherent in these simply-put expressions of mutual respect. Bala ga Lili maquette. 2016. Photograph: Connor Tomas O’Brien. In 2016, Bonhula travelled to Melbourne and the pair embarked on their first art-based collaboration. The sculpture, aptly titled Bala ga Lili comprises three parts, Wunhakali (Other Side), Black Light House (Gurrnjann Djarratawun Wanga) and a video filmed by Connor Tomas O’Brien. Damien Wright and Bonhula Yunupingu. Bala ga Lili. 2016. Wunhakali (Other Side). Gadayka, Copper Wire, Epoxy Resin, Tung Oil Finish. Black Light House (Gurrnjan Djarratawun Wanga). Ancient Red Gum, Copper Wire, Tung Oil Finish, Video. Dimensions: variable. Photograph: Connor Tomas O’Brien. Videography: Connor Tomas O’Brien. Bonhula working on the copper binding of Wunhakali (Other Side). 2016. Materials: Gadayka, Copper Wire, Epoxy Resin, Tung Oil Finish. Photograph: Connor Tomas O’Brien. Wunhakali is juxtaposed with Black Light House (below), a pitch black, rectilinear form constructed with red gum, the same 10,000 year old timber used by Damien in the Koori County Court table to signify the presence of an enduring culture on and of this land. 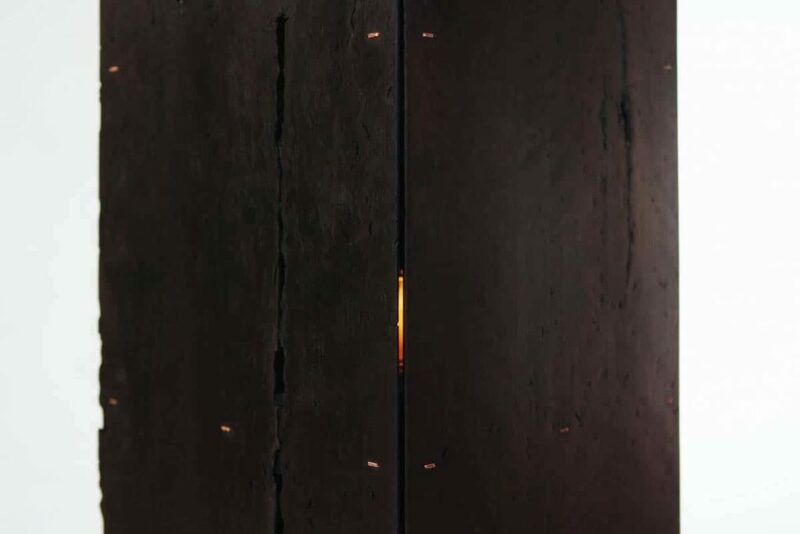 If you come close enough, a flame may be glimpsed flickering in its interior (below). 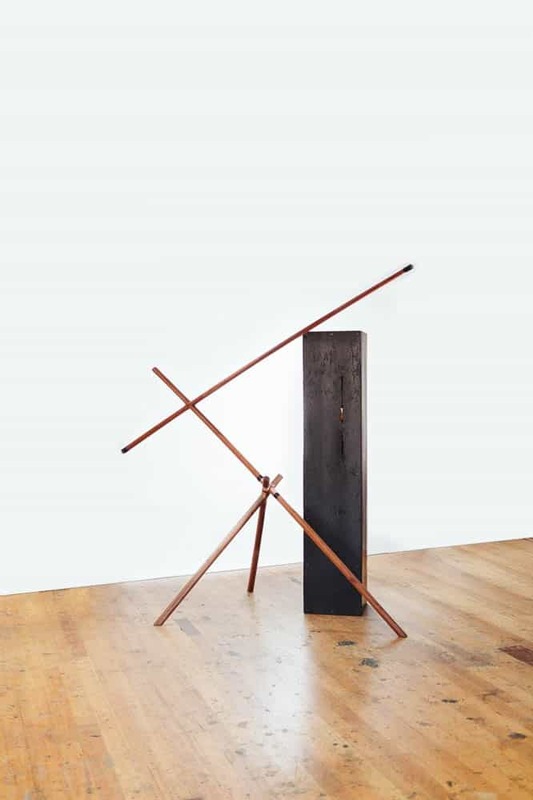 Black Light House’s simplicity belies its connotations of complex relationships to land, possession and aboriginality. Although it’s black and the gurrtha is central, its form and power are directly descended from the Roman civilisation. It begs questions about hierarchical power structures and the friction resulting from the repurposing of place by those who colonise. Damien Wright and Bonhula Yunupingu. Black Light House (Gurrnjan Djarratawun Wanga) (detail). 2016. Ancient Red Gum, Copper Wire, Tung Oil Finish. Dimensions: variable. Photograph: Connor Tomas O’Brien. Although this reading of the work makes perfect sense to the academically trained eye, as my journey with Bala ga Lili progressed, I discovered that two-ways learning is all-consuming. Having had phone calls with both Damien and Bonhula, I realised that my literal analysis can oversimplify complex issues. In a culture saturated with images that draw on a range of Western codes assimilated since birth, it’s easy to forget to question the way we find or apply meaning. We seldom take a step back and reconsider what it is we are actually seeing. For Damien, Bala ga Lili speaks more of unfinished sentences than neatly packaged storylines. What came clear for him was that the real power and meaning was the act of collaboration. Bonhula (left) and Damien (right) working on the design development of Bala ga Lili. 2016. Photo: Connor Tomas O’Brien. Thanks to both Damien and Bonhula for the laughter, time and energy they brought to the writing of this story. Gideon Haigh. (2009). The Pursuit Of Usable Beauty. The Monthly. Michelle Montgomery recently completed a Bachelor of Art Theory at UNSW Art & Design. Combining image theory with her previous studies in art history and textile design, her passion is the history and theory of textiles and adornment. 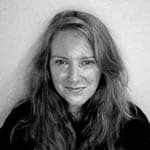 She is currently an Honours student at the University of Sydney and her research relates to the construction of identity and tribe via dress in a globalised world. See also her articles: Tuhirangi Writes on the Sky and Return to the source: Women’s work thrives in Utopia. What a lovely essay. Thanks heaps. I enjoyed getting to know you and appreciate greatly your effort to understand and express what we are doing. Thank you both for your encouraging words. @Damien, it was a pleasure from start to finish – bala ga lili is contagious. @Ruth, I don’t think there could be any greater compliment – thanks!